Today is #WorldMentalHealthDay a global day aimed at raising awareness, tackling the stigma and highlighting the lack of funding for mental health conditions. “One in four of our society will experience mental health problems at some time in our lives and resources are currently stretched to the limit so this campaign aims to help those in most need today. 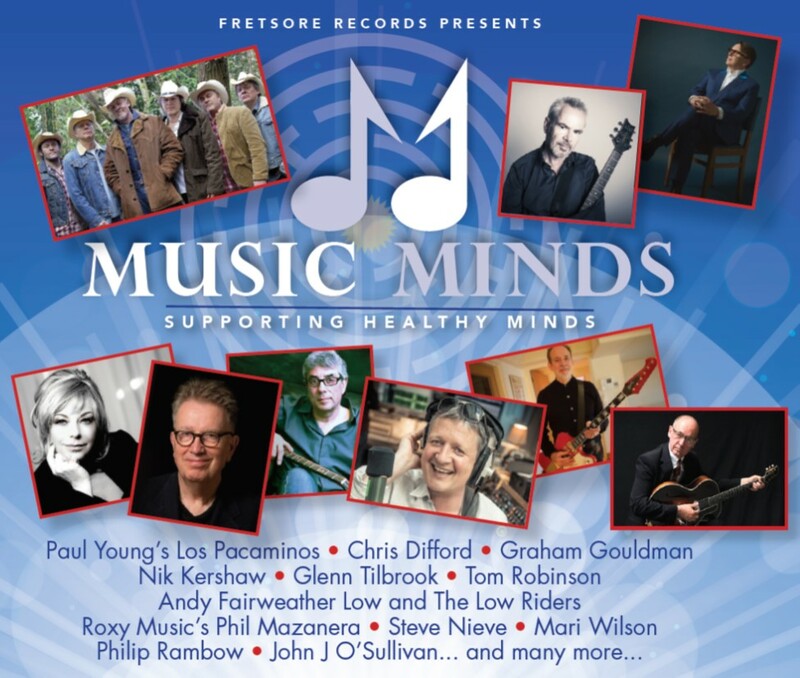 We are delighted to have received around 50 songs – many are rare, unreleased or specially including contributions from multi-million selling artists 10cc’s Graham Gouldman, Nik Kershaw, Squeeze’s Glenn Tilbrook & Chris Difford, Roxy Music’s guitarist Phil Manzanera, The Christians’ Henry Priestman, Paul Young’s Los Pacaminos. We also wanted to showcase songs from bands who deserve a wider audience; My Autumn Empire, Field Harmonics, Junkboy, EL Heath, Yellow6, July Skies, Man Without Country and many more. A 3-CD box set will be available from the 12th of October through Amazon, digital download from iTunes and other digital service providers and streaming on Spotify. We also intend to release a number of the songs from the album with promotional videos to keep the mental health conversation going. An animated cartoon, showing many simple to follow tips for healthier minds, has been released on the Music Minds YouTube page. The soundtrack is a new version of Lou Reed’s ‘Perfect Day’ with arrangement and instruments played by Steve Nieve and with vocal performances by many of the contributing acts. A live performance captured in the recording studios when contributors recorded their vocals for ‘Perfect Day’. “Sometimes it seems like we need to strive to normalise being open, tolerant and empathetic, that these qualities aren’t particularly valued in society. The more non-judgemental we strive to be in whatever spaces we inhabit, the more people will feel able to talk about mental health and the stigma associate with it will vanish. We can but try! We’re human, sometimes we fail. It’s ok. Ian Sephton approached us that rare thing initially (a fan of Junkboy) and when he outlined why he wanted to make the Music Minds album and the impact engaging in this process was having on his own wellbeing, we were even more enthused and proud to be part of it.